Researchers use nanoparticles at specific temperature to stimulate antitumour response. Seeking a way to stimulate antitumour responses via the immune system researchers from the Norris Cotton Cancer Center at Dartmouth have identified the precise temperature that results in a distinct body-wide antitumour immune response that resists metastatic disease. The team used mild hyperthermia to treat an identified tumour prior to surgery, the data findings show excellent promise to strengthen antitumour response and help stop metastatic disease. The study is published in the journal Nanomedicine: Nanotechnology, Biology and Medicine. Among the many options for cancer treatment pursued by science, immunotherapy is a contemporary focus state the team. The immune system recognizes and usually eliminates small tumours, but other tumours become clinical problems and are known to block the antitumour tendencies with a natural system for immunosuppression. Previous studies have shown how to reverse this tumour-mediated immunosuppression. In addition phagocytes, which are key actors in immunosuppression and immunostimulation and that quickly take up nanoparticles, have provided options for new strategies. The current study done in mice with a melanoma tumour model, began with inserting iron nanoparticles directly into the tumours while applying an alternating magnetic field to heat the nanoparticles evenly and at precise temperatures. The team explain that while it’s easy to apply enough heat to destroy the tumour, that sort of thermal ablation does not have the desired result to stimulate a systemic immune response to eliminate metastatic disease. Looking at temperature variables the researchers learned that at precisely 43 degrees centigrade, the systemic immune response goes into action. The current study showed that doing this safely is a potent treatment approach that can stimulate the immune system to fight untreated metastatic tumours. The team now look forward to joint studies testing the systemic immune response to nanoparticle treatment in dogs with melanoma. As in humans, melanoma is frequently metastatic and fatal for dogs. If the systemic immune response can be shown to prevent metastatic disease in dogs, it will be ready to develop for human clinical trials. Mechanism of anti-tumor immune resistance induced by local hyperthermia treatment. 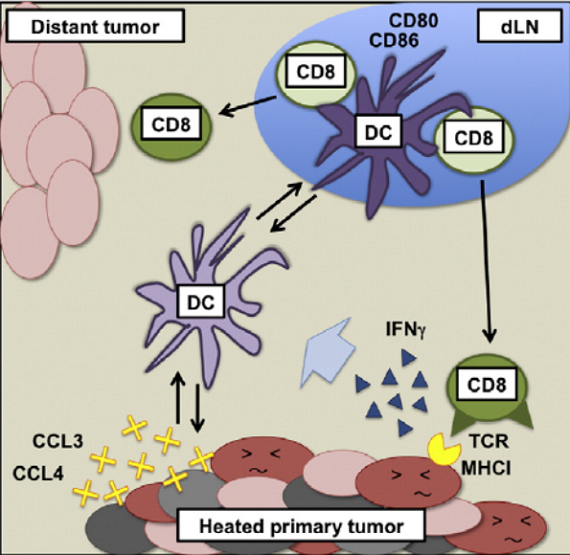 Local hyperthermia treatment of tumors induces CD8+ T cell-mediated resistance against distal and secondary tumors. Fiering et al 2014.